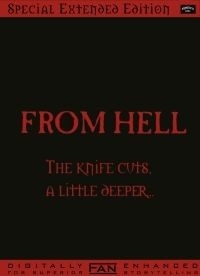 Added all but one of the deleted scenes back in to round out the story and make it an overall more creepy movie. To have a more complete version of From Hell. - Sc. 35 – 36 Abberline’s wife / Dark Annie Dream / Waking up to Dog. - Sc. 136 kate looks in bar window for Liz.